So, you’re either thinking about, or have decided to run your own away day for your team. Before you start, it’s really important to think about the role you want to have on the day upfront, especially if in your day job you are a team member, or the team leader. In many ways it helps if you choose to be objective. This doesn’t mean you have to come from outside the business or team, though. It simply means that, for the purposes of this group process, you will take a neutral stance. 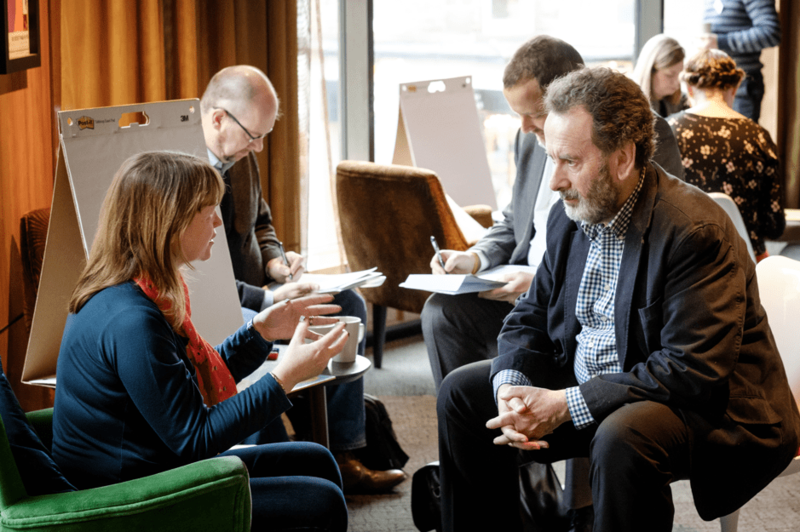 You will step back from contributing to the detailed content and from your own personal views, and focus purely on managing discussions, getting the best from everyone, and bringing the event through to a successful conclusion. Avoid frequently having the first or last word in a discussion. Always summarise key points from discussions once they’ve concluded and make sure you represent the wider consensus, rather than leaning towards your own views. What the away day leader does is plan, guide and manage an event to ensure that the group’s objectives are met effectively, with clear thinking, good participation and full buy-in from everyone who is involved. To achieve this, it is likely that you will need to call on a wide range of skills and tools, from problem solving and decision making, to team management and communications. Photo: Some of my delegates created an ‘ad’ for a creative facilitator on an innovation course I ran recently. Designing and running the session to achieve the agreed objectives. Providing space and time for the team to discuss, explore, imagine, challenge themselves and each other, and make key decisions on the way. Capturing and recording the outputs visually as the session develops, so that word and ideas don’t just disappear into the ether. Keep people on task when they wander off. Keeping the energy of the people in the room where it needs to be for the task in hand. For example, playful and creative for idea generation, thoughtful and reflective for making important choices. Providing the right activity, pace and perspective at the right time. Managing time – so that what the team came together to do gets done. Getting the group to work at an appropriate level of detail – neither too much nor too little. What words do I want the delegates to use to describe me as the away day leader at the end of the session? Then think about how your behaviours and approaches will deliver that aspiration, and use these words to ‘check in’ with yourself at points throughout your session to keep yourself on track. Photo: One of Dr. Jo’s regular and favourite away day venues, Sunborn Yacht Hotel, Gibraltar. I recommend that you use this checklist every time you plan an event to make sure that you are clear upfront about what you’re aiming to achieve and why. Time spent at this stage is a very good investment, and will really help you have a successful away day. 1. What is the specific purpose of the event? 2. Why have you chosen to do the event at this time / now? 3. Who is expected to attend, and why? 4. Where will the event be held, and why? 5. Have any previous events been held on this or s similar theme, and what were the outputs (so that you can acknowledge and build on this as appropriate)? 7. Are there any factors that will any factors that will help the achievement of the know, feel, think and do outcomes? And are there any that could hinder? Once you have all this information, it is important to challenge yourself to ‘test’ your thinking before detailed design happens and invitations are sent out. Photo: Expanding Your Creativity Session. Dr. Jo in action at The Grand Hotel, York with York Professionals. Will you have the right people in the room? You will need experts, a positive disruptor or two, some people with fresh perspectives as well as some with experience, and perhaps, depending on what your event is for, a decision-maker. Will there be any ‘hierarchy’ in the room, or will that be placed aside for the session to allow freedom of discussion and idea generation? Quite often, I will suggest that hierarchy is ‘parked’ for discussions, idea generation and problem-solving, but that someone is named as ‘decision-maker’ for when something important, such as shortlisting key priorities, or signing off investment or actions, is needed. The decision-maker is not always the most senior person present, so it’s worth thinking about who that will be beforehand and checking it out with them, and your event sponsor. Have you got enough time to achieve your objectives? Make sure that your aims are clear and that you’re not being overly ambitious about what you can achieve in the time you have, and that you’re not trying to answer too many questions at once. Clarity and focus are key. o Space and also ‘permission’ to stick flipcharts to the wall. o Enough space for everyone to move about. o For numbers about 10-12, The facility to set up tables ‘cabaret’ style in small groups, rather than in rows or boardroom layout. o A room with natural light. o Access to reasonable breakout areas and self-serve refreshments on tap. o Snacks and a lunch that are light and energising, rather than stodgy and fatigue-inducing. Finally, create a session invitation for attendees that creates a positive perception of the day, and an anticipation that it will be a great event that they really want to be part of. For more tips, an agenda and a range of creative activities to use on your away day, download my free DIY Away Day Toolkit here. I’d also love to help you by facilitating your event. If you’d like to know more, do get in touch at [email protected] and we can book in a no obligation discovery call.